Precor 9 23 Treadmill Review – It’s Time To Get Walking! Exercise is something that we all know we should do, but few put into practice. By exercising we burn more calories during the day to keep the fat at bay. It also strengthens the heart muscle, lowering our long term risk of cardiovascular disease. Walking is a nice low impact exercise that is safe for the knees and can be done at any age; however, the weather does not always accommodate a nice stroll outside. This Precor 9 23 Treadmill review will present a potential solution for this problem. 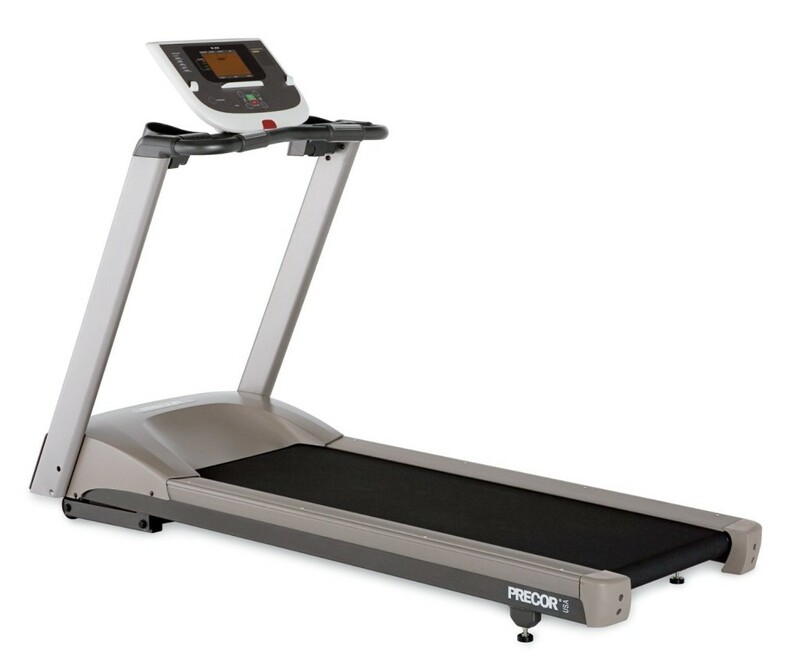 The Precor 9 23 Treadmill allows you to walk indoors away from the elements or diesel exhaust fumes. It can also provide a more customized workout that your local streets cannot match. Perhaps the best bonus of all is being able to workout while catching your favorite shows on television. Who says multi-tasking is not effective? One of the greatest features of the Precor 9 23 is that it gives you access to a high quality machine normally reserved for expensive fitness clubs in the comfort of your own home. This is not some flimsy treadmill that you buy at the local big box store. It is 227 pounds of high quality equipment built to last. The manufacturer offers a lifetime warranty on the frame and welds, a five year warranty on parts and items that wear, and a one year warranty on labor. This particular model is designed for people who have shorter arms than average. It is 81 inches long, 31 inches wide, and 54 inches tall. This provides plenty of space to get a good workout, while minimizing the footprint in your home. The size of the walking belt is 57 inches in length by 20 inches in width, plenty of space to walk at a brisk pace. This is the same exact dimensions typical in expensive commercial models. One of the great features of this particular device is the patented Ground Effects Impact Control Technology. This technology attempts to lessen the impact on the joints from long duration walks. There are several different ways this is accomplished. The front portion of the treadmill is fitted with shock absorbers. These provide a good amount of give on every step forward. However, at the same time there is a solid pivot point in the back of the treadmill to serve as a solid foundation to take steps forward. At the same time, it does provide some give so pushing off is still comfortable. The net effect is a great feel that will allow you to walk further without the legs feeling fatigued. You can workout with the device without generating too much noise due to a quiet three horsepower motor. The belt comes coated with a polyvinyl chloride surface to ensure that your foot grips it solidly, lowering the chance of slipping. There is also a place to hold two water bottles and other items you might be using while you take a nice stroll in the comfort of your own home. The device provides a full electronic console of features. The speed of the device is adjustable anywhere from half a mile per hour to a full twelve miles per hour. You can also adjust the incline during your workout from a flat grade to a 15% tilt. There are a total of six different programs you can use to vary the intensity of your workout so you get in the most optimal shape possible. This Precor 9 23 Treadmill reviews from customers are excellent due to its high quality and extensive list of features. It is time that you incorporate more exercise into your daily routine, and purchasing a Precor treadmill is an excellent first step in accomplishing this goal. One feature that ensures you get the optimal burn is the SmartRate feature which monitors your heart rate real time. This is vital if you want to make sure that you are in your optimal workout zone for maximally improving cardiovascular health and shedding the fat. In addition to the heart rate you can monitor factors such as distance walked, current rate of speed, duration of the workout, the current incline grade, the time, and an indicator if your heart rate is in the optimal zone for your goals.